It’s funny really. I’m penning this review on the Wii U’s second birthday in the UK. It’s been a hard 2 years as a Wii U owner, with the lack of 3rd party support and lack of first party titles to make up for it. The drought is slowly coming to an end, and spearheading this movement is a game many people, Wii U owners and potential owner alike, have been waiting for. 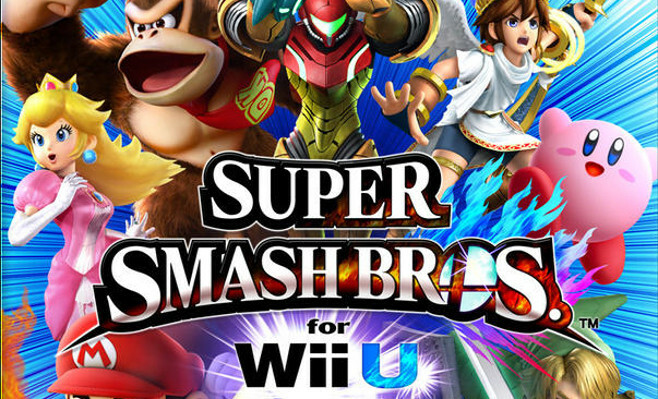 Super Smash Bros for Wii U is the latest entry into the popular Super Smash Bros franchise. It’s a game where popular Nintendo (and some other cameo) characters are pitted together in a 2D fighting game with a difference. Smash Bros typically plays more like a brawler than a fighter, which has lead to many hard fought year sof getting Smash Bros noticed as a true fighting game. A big help was the Smash Invitational at E3, hosted by Nintendo, where top fighters from around the world came together to show off Nintendo’s next installment of the fighting game. In terms of the normal run of the mill fights, you can tell it’s been geared towards those competitive players. The pacing fits nicely between Melee and Brawl, with it being closer to Melee with pace, and closer to Brawl in terms of power. This provides a smooth and balanced experience that feels nearly perfect and rather enjoyable and satisfying (there’s nothing more satisfying than landing a Falcon Punch). The only drawback is that a lot of moves feel rather punishing and can leave you feeling like you’re fighting yourself rather than your opponent. The character roster is a plentiful tool, with over 40 characters on offer. There’s a decent amount of variety on offer, with characters like Little Mac, Duck Hunt Duo and Shulk playing fairly uniquely. Other characters have been improved as well, making characters like Bowser and Ganondorf a lot more playable. Falco and Yoshi are but two of the dud characters in the roster that are pretty poor to use, with similar characters in the roster being a lot more playable. The stage selection is lacking compared to Brawl, however, the inclusion of Omega stages (completely flat versions of the stage, with no stage events) are welcome, and allows you to experience the whole game, if you like playing without the stage events. The stage builder offers a bit of promise at first, giving you the ability to draw the stages on the gamepad. It’s a bit limited though and isn’t as nearly as extensive as it was in Brawl, with many features not included this time around. That’s not to say you can’t have fun with the stages, just that there isn’t as much in terms of extras that add the variety to the custom built stages. Away from Smashes, there’s the usual Classic and All-Star modes, where you fight waves of characters without dying. Classic is the best-improved mode between the two, and takes a less linear path than in previous titles, giving you the option to choose which group of fighters to go against. Home-Run Contest and the Angry Birds style game Target Blast also return from former titles and remain a nice distraction from the fighting. Event matches are back too and feel a lot more challenging than before, sometimes frustratingly so. Special Orders is a new mode where you fight a number of waves of enemies from tickets you select. You get prizes for winning, which you can collect after you beat either Master Hand or Crazy Hand. Master Orders feels the more tedious of the two, as it forces you to slog through match after match with seemingly no end, with Crazy Orders being a bit more free flowing, with higher costs for participating but bigger rewards. The other new mode is Smash Tour. This replaces the lackluster Smash Run from the 3DS version of the game. Smash Tour has you go round a board, of which there is 3 types, and you collect power-ups to improve your fighters so that you can be the most powerful when it comes to the final battle at the end. It’s a bit like the Mario and Wii party games, just with more smashes in the middle. While it’s more fun than Smash Run, it’s still tedious and overly relies on luck as opposed to skill. Customizations make their return from the 3DS version. The system hasn’t really been changed much and works pretty much the same. It also still has a heavily limited use in the game and still feels a bit pointless. One of the plus sides though is making characters that have their strong points increased (for example, Bowser being even more powerful) and then just watching the chaos of pitting those modified characters together It’s brought a lot of laughs, as Bowser dropkicks all his enemies off the screen at once. 8 player smashes are also a lot of fun and are extremely hectic. It’s a feature we never knew we wanted until all 8 of us sat down and tried to beat each other all at once. The only problem is that the stage selection feels really limited when using 5 or more people, with the already small choice being cut by half. The controller options are expansive, with several varieties of controller available, including 3DSes with a copy of Smash 3DS in them. It makes it a lot easier to get people playing with the control scheme they really like, with all schemes being fully customizable to people’s tastes. For a Nintendo title, the online is actually pretty good, with it being fluid most of the time, although a bit cumbersome (with some hilarious outcomes). It’s pretty easy to get into matches as well, with only a short amount of time sat in matchmaking. If you’re playing on a decent connection, then a decent amount of the matches aren’t too laggy, which makes a change from the Nintendo norm of kicking everyone for the slightest bit of lag *cough* Mario Kart 8 *cough*. Trophies make a return and there is an awful lot of them this time. They’re in all of the high quality and you can tell that a lot of effort has been put in to make them as accurate as possible. There’s also a huge sprawling soundtrack, most of which is simply fantastic (I’m writing the review to it) and is rather expansive. At the 40 hour mark, at which the review is being written, we’ve managed to unlock 360 pieces of music with plenty more left to find. It’s gloriously massive and there’s a track in there for everyone. Taking a formula that works well and improving on it year in, year out seems to be what Nintendo does best and it’s safe to say that’s what’s happened here with Smash for Wii U. After the disappointment of the 3DS version, there was some doubt in my mind about the quality of this version, but this game makes a point that it’s very different, very quickly, eclipsing the 3DS version in nearly every way. That’s not to say there isn’t room for improvement, however, with a true single player mode being a better addition than Smash Tour. It’s one of the best games out for Wii U right now and it’s easily the definitive game in the Smash series. Good job Nintendo and Namco Bandai, now back to playing Smash for me.